(from the exhibition’s website) In the ten years since Glenda Bailey became Editor in Chief of Harper’s Bazaar, she and Creative Director Stephen Gan have carried on the magazine’s tradition of publishing high-impact photography. 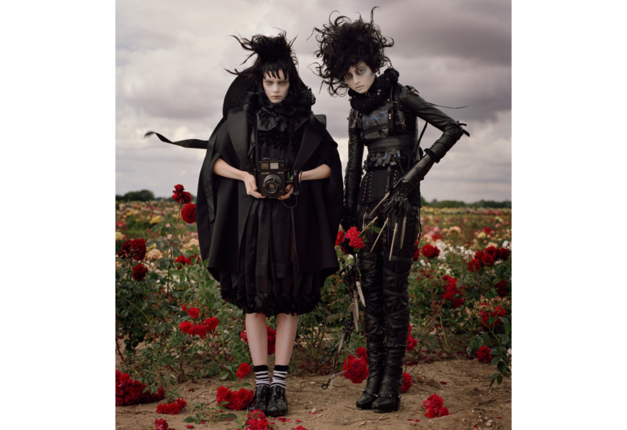 This exhibition distills that decade into a choice group of nearly thirty images by some of the most important photographers working today, including Peter Lindbergh, Jean-Paul Goude, David Bailey, William Klein, Patrick Demarchelier, Sølve Sundsbø, Tim Walker, Mario Sorrenti, Hiro, Melvin Sokolsky, and Karl Lagerfeld. Among the artists represented are Nan Goldin, Ralph Gibson, and Chuck Close. Along with inventive fashion images in a wide range of styles, from classic to cinematic, there are vivid portraits of designers Marc Jacobs, Karl Lagerfeld, and Diane Von Furstenberg, and celebrities like Daphne Guinness, Lady Gaga, and Julianne Moore. To emphasize the work’s original context and the magazine’s award-winning design, issues in vitrines will display extended stories as well as Bazaar‘s high-impact subscribers’ covers. ICP Guest Curator Vince Aletti previously co-organized ICP’s dramatic “Year of Fashion” in 2009, including the shows Avedon Fashion 1944–2000,Weird Beauty: Fashion Photography Now, and This Is Not a Fashion Photograph. This entry was posted in Exhibition and tagged Fashion Photography, Glenda Bailey, Harper's Bazaar. Bookmark the permalink.